I am the Social Media coordinator for the parish, which means that I create daily posts in one form or another to help our people meditate and pray; Facebook, Twitter, Videos, blog. Last Lent, when I didn’t have grandchildren under foot or any thought that I would have the nonstop interruptions of growing boys, I began to do a daily series of emails called Daily Inspirations that use a quote from a saint, catholic/christian writer, or scripture. This was not difficult to do – at first. But like everything I begin with this ADHD addled brain, it’s harder and harder to keep it up. This morning’s Daily Inspiration was from Erma Bombeck, a writer I’ve always loved and who died much too young. The quote was, “When I stand before God at the end of my life, I would hope that I wouldn’t have a single bit of talent left so I could say, ‘I used everything you gave me.’ As I posted it, I thought that perhaps I should add something else, so I thought I’d look up the Saint of the Day to see if there was anything I could use. 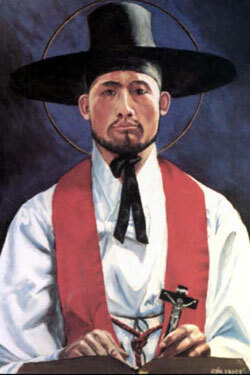 Today, September 20, is the memorial of Andrew Kim Taegon, Paul Chong Hasang, and companions. I’ve seen these names for years, but never really bothered to find out anything about them other than the fact that Blessed Pope John Paul II canonized them in 1984. I knew that Andrew was a priest and I kind of assumed that the companions were other priests; however, as I began to read their story I was brought to tears. Christianity kind of sneaked into Korea by the back door. The Japanese invaded the country in 1592 and some of the people were baptized, probably by Christian soldiers. Years later, Jesuit literature managed to get into to the country and the people began a home church under the radar of the authorities. When a Chinese priest managed to get into Korea, he found around 4,000 Catholics who had never seen a priest, never been to a Mass or never had the Eucharist; nevertheless, they managed to keep a faith alive underground. In spite of the fact that his father was martyred for the faith, Andrew left Korea to study for the priesthood in China and return after ordination. Eventually the community was discovered. Andrew, at the age of 25, and Paul, a lay apostle, were beheaded. Thousands of nameless Christian men, women, and children were tortured and executed for their faith in terrible and grotesque ways. Only one person is said to have denied the Faith and be spared; however, he then returned and recanted, knowing that he would be executed on the spot. At this very moment Faith is on every news provider’s website, blog, news show and chat page because of protests over a video, and now a cartoon satirizing Mohammed. Islam is violently angry that the West is showing such callousness and disregard of their Faith and laws. As a Catholic, I feel like saying, “Welcome to my world.” But that would be kind of smarmy. The truth is that here in the United States and in many western countries, all faiths are being challenged in the press and in the courts. The deeply held religious values and beliefs of many people are mocked and derided daily in every kind of public forum. Those who have professed to be without any faith seem to be preaching their (non)beliefs the loudest. If we can’t stand up to this, what would happen to us if real persecution were to start? If we hang our heads and apologize for who we are and what we believe now, who would be able to remain strong if asked to witness to our faith under serious threats to our lives or lifestyle? If public worship were condemned and outlawed, would anyone keep the faith? This entry was posted in The Church Diva and tagged belief, Catholic, faith, Korea, Protests, religion, Saint Andrew Kim. Bookmark the permalink.